A quick note on 1st cycle Bonaparte's and their tail bands. Specifically, what is the pattern on the outer rectrix (R6)? Does the blackish band extend onto the outermost feathers? Seems like a simple question. In their account on "juveniles", Olsen & Larsson describe T6 (=R6) as being white with white tips. 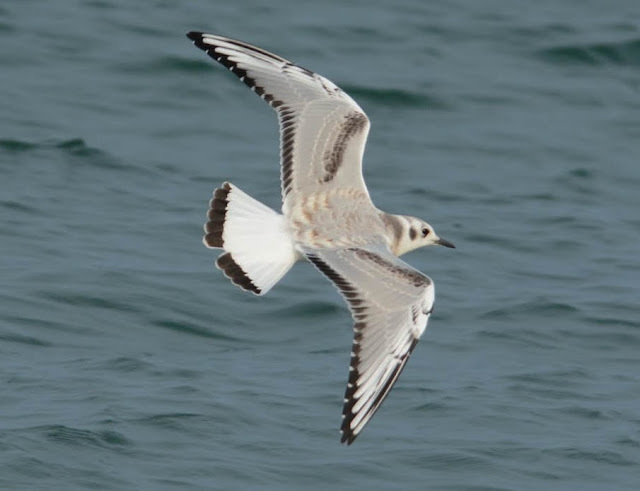 But in the "first summer" account, they imply the outer tail feather does have black markings. This is somewhat confusing and should be clarified. 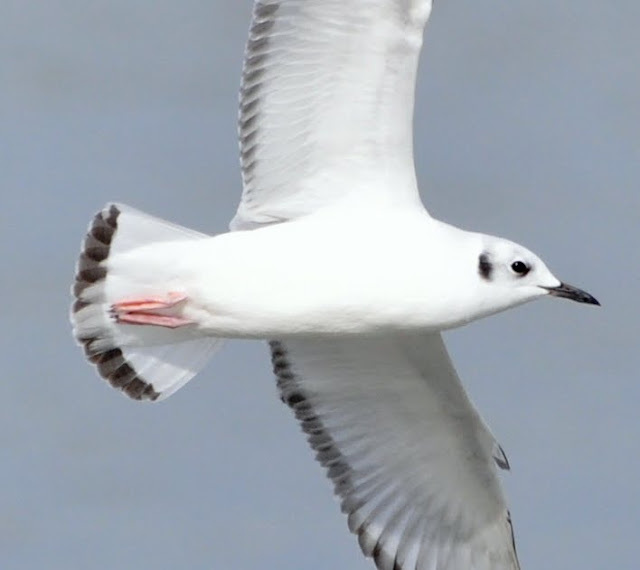 First cycle Bonaparte's Gull. R6 apparently white. The tail band on this individual doesn't extend onto the outermost tail feathers. Cleveland, Ohio. November. Howell & Dunn, however, note that some pigment is found on the outer tail feathers, but limited to the inner webs. 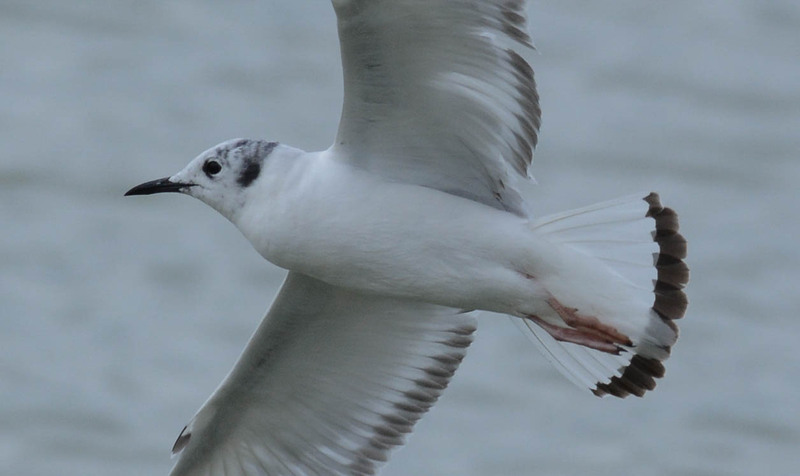 As described in Gulls of the Americas, this individual shows some black on both outer tail feathers, but the pigment is limited to the inner web. Evanston, Illinois. April. Looking through tens of 1st cycles in my photo collections, I mostly agree with Howell & Dunn, that on average, when there is black on the outer tail feathers (which is rather common), the black is generally limited to the inner web. But not always. Some individuals clearly show pigment beyond the feather shaft. 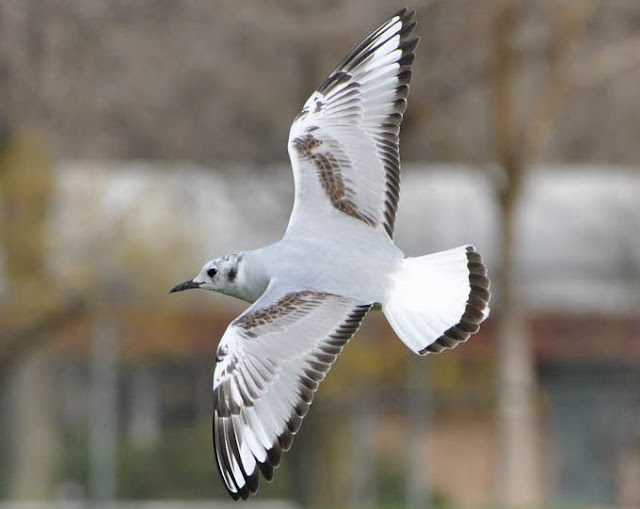 First cycle Bonaparte's Gull with pigment on R6. The pigment crosses over the feather shaft and onto the outer web on the left R6. New Buffalo, Michigan. September. Interestingly, when viewing the ventral side of the tail on those individuals with pigment on R6, it usually appears there's more pigment from below than above. This, I suspect, is mainly because the inner webs of the outermost tail feathers are more visible when viewed from underneath. From above, the outer webs are more exposed. Left R6 shows a substantial amount of pigment. Manitowoc, Wisconsin. May. Although the pigment spills onto the outer web of R6, it doesn't reach the outermost edge of the feather. Chicago, Illinois. November. 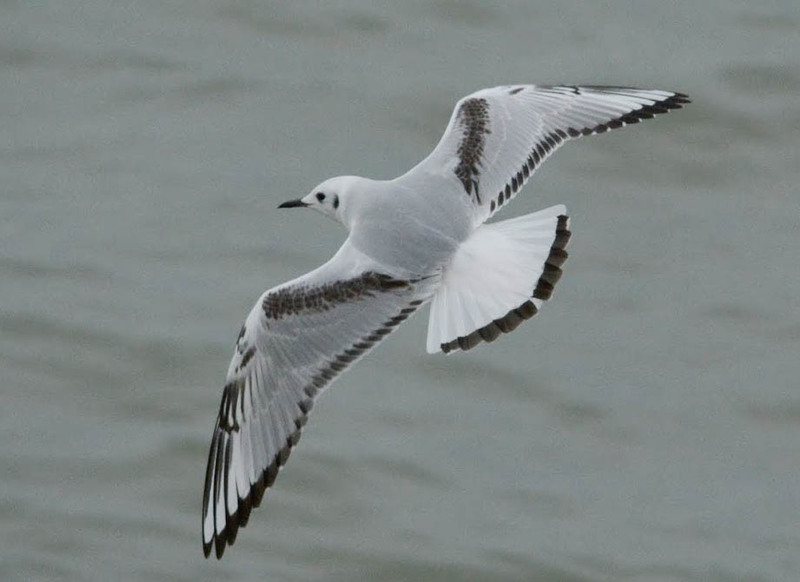 As I've found with 1st basic Franklin's, Black-legged Kittiwakes, Little and Laughing Gull, the pigment on the outermost tail feather appears to be more variable than generally thought. I suspect the same might hold for other species such as Sabine's and Black-headed Gull.